What an amazing job turned in by the cast and crew of Mary Poppins – the 2019 Halsey Musical directed by Ms. Schwarz. Monday, April 15th – a dress rehearsal in front of 600 5th grade students and senior citizens from a local senior center. Tuesday, April 16th – The first night show in front of over 400 family and friends. Wednesday, April 17th – The second and final show in front of over 400 family and friends. We are all very proud of our students for the hard work and dedication they showed. You understand that on top of rehearsals 5-6 days a week they still had school, homework, studying for tests, and chores at home! Like all our students at Halsey JHS 157 they are just an amazing group of young people. On Thursday, March 28th from 3:00 pm until 5:00 pm Halsey JHS 157 will continue our College Access for All program. Tickets will cost $5 and can be purchased in the school cafeteria during lunch starting Monday, March 25th. We will have some very special guests throughout the day as well. The Harlem Magic Masters will be in attendance to speak with the students during the school day. They will also perform an amazing halftime show during the Student Tournament!!! TEST PREP IS CANCELLED THIS DAY FOR MARCH MADNESS! We are now putting together our 6th grade Robotics Teams. This is for 6TH GRADE STUDENTS ONLY! Please contact Mrs. Elfers at PElfers@schools.nyc.gov for more information. As you know we have kicked off our Leukemia & Lymphoma Society fundraiser. After only 2 days of collecting we have raised over $1600. We will be hosting an event called Stuck for a Buck on Wednesday, March 20th at 2:30pm in the school cafeteria. What is Stuck for a Buck? 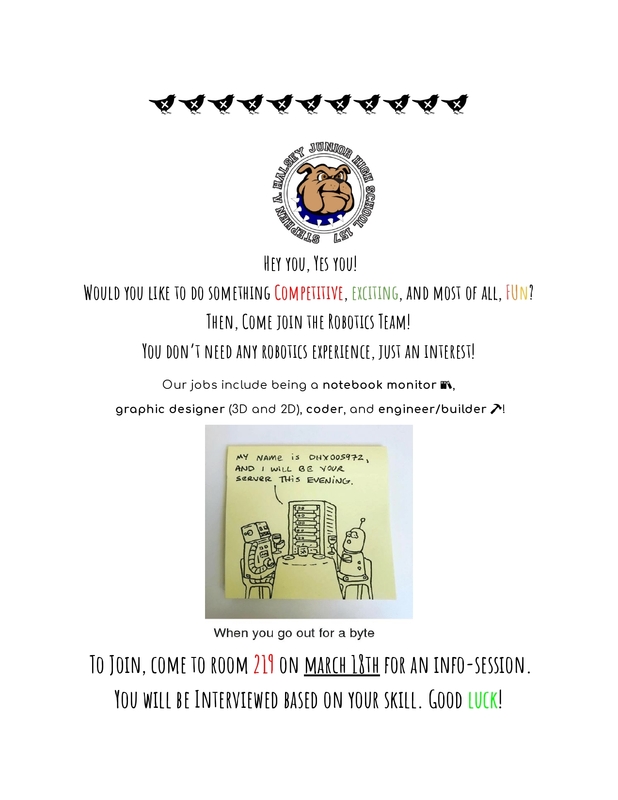 Students can come to the office of Mr. Zevon and purchase a ticket for $1 or 5 tickets for $5 and so forth…on March 20th the students will exchange each ticket for a long piece of duct tape. The students will use the duct tape to tape their teacher to the wall. A number of teachers will volunteer and the students will vote on which teachers get selected. Its a fun way to raise money for an awesome charity. Please consider sending your children in with any spare money you have to purchase tickets for the big event. OH – TEACHERS CAN PARTICIPATE TOO!!!! I mean who doesnt want to duct tape Ms. Stillwell to the wall? I know Mrs. Astorga said she does! I think I heard Mr. Lober say something about wanting to Duct Tape Mr. Freydin to the wall.